The playoffs are over and the Super Bowl teams have been determined. On February 5, the New York Giants will face off with the New England Patriots. My husband, who was born and raised in Staten Island, is excited about the Giants – even though I pointed out to him that the Giants really belong to New Jersey, since they are based in East Rutherford, New Jersey. Since my team didn’t make it to the Super Bowl thanks to the Giants (there’s always next year, Falcons), I’m trying to psych myself up for the big game by choosing a side based on how attractive I find their home cities. First up: East Rutherford, New Jersey. East Rutherford is just seven miles from New York City, which means residents have access to the City That Never Sleeps for work and play. This is the place for major sports fans – not only is it home to both the Jets and Giants, but also horse racing and college basketball. Just a few minutes away, the Prudential Center is home to the New Jersey Devils hockey team, which (along with the New Jersey Nets, soon to be the Brooklyn Nets) used to also call East Rutherford home. Until these two teams moved to Newark, East Rutherford was home to five major sports teams. No doubt about it – East Rutherford residents always have something to cheer about. And when they aren’t cheering on others, the borough has a great park system with ball fields and tennis courts. The Hackensack Meadowlands Conservation and Wildlife Area is located along the eastern boundary and offers several hiking trails. And with the world-famous Central Park just a few miles away, residents have plenty of opportunity for outdoor recreation. With a charming, eclectic downtown filled with unique, locally-owned businesses, East Rutherford is the kind of place where shop owners know your name – an impressive feat for a borough in the most densely-populated metro area in the US. Stroll along Paterson Avenue and be charmed by the collection of cafes, diners, pizzerias, and shops. 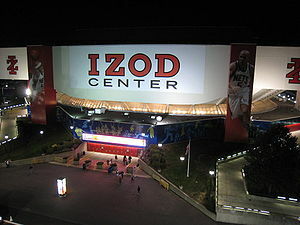 Catch a concert or a basketball game at the Izod Center. Place your bets at Meadowlands Racetrack. And, when it opens, enjoy the amazing shopping experience at the new American Dream-Meadowlands, a vast entertainment and shopping complex with an amusement park, water park, ice rink, stores, restaurants, and more.